Why do so many of our brides and grooms register for this item? Utility, warmth, versitility. Use a plates on burrito night, or as a tray. Classic round Acacia wood salad bowl, This bowl will last years and years with proper care. Generous size to serve a large group of guests. Use for salads, fruit salad, pasta or even popcorn! Our Acaciaware 12" Round Plate set is great for tapas and appetizers, as well as salads. Entertaining is a breeze with these beautiful, eco-friendly plates, as they will certainly be the talk of the table. We love the shape and feel of this bowl. 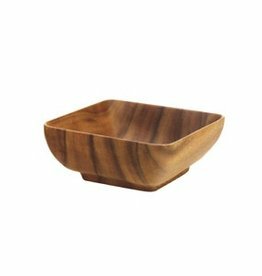 Generous in size, this stylish acacia wood bowl is perfect for salads, fruit salad, breads, or as a pasta bowl. Carved from one piece of wood, this little bowl will serve your salads, sauces, and sides. Like all woodenware, great for tailgating and outdoor entertaining. This lovely piece will be used every day. For salads, pasta, popcorn, or chips, it works for you, your family, or a crowd. A beautiful, hand turned, Acacia wooden bowl by Pacific Merchants will look great on your dining room table brimming with fruit, salad, or a fine silk flower arrangement. These acaciawood bowls are the essence of fine decoration and function. Everyone needs a nice set of wooden salad servers. These are beautiful and affordable. Also available in 14” length. Oversized and ready for a party! What a perfect wedding gift. This eco-friendly acacia hardwood, harvested from privately owned lands. Acacia wood is naturally resinous, resisting penetration by liquids and the hardwood will not stain or pick up odors. Snacks, salads, or catchall. Carved from one piece of wood. Upkeep is simple - wash with mild detergent and touch up with mineral oil from time to time. Great size for setting an organic or tropical table - inside or out. They make great trays barside as well. Entertaining is a breeze with these beautiful, eco-friendly plates, as they will certainly be the talk of the table. Carved from one piece of wood, this is a perfect everyday essential for green or pasta salads, popcorn, or chips. Square Wooden Pedestal Bowl - Large 10" x 10"